To define upholstery you have to delve into Middle English terms and look at the word ‘upholder’. An upholder was someone who upholds or maintains. There are strong suggestions these tradesmen were involved in repairing and maintaining furniture, rather than working on new pieces. The word upholstery evolved from this, and has come to mean both repairing and crafting brand new products. Upholsterers would work on seats and other furniture using a variety of springs, webbing, and padding along with fabric or leather covers. The traditional version of the craft used coil springs, animal hair, wool, hessian and straw, before the craft evolved to include sewing machines, synthetic fibres, and more comfortable furnishing, and elaborate techniques. 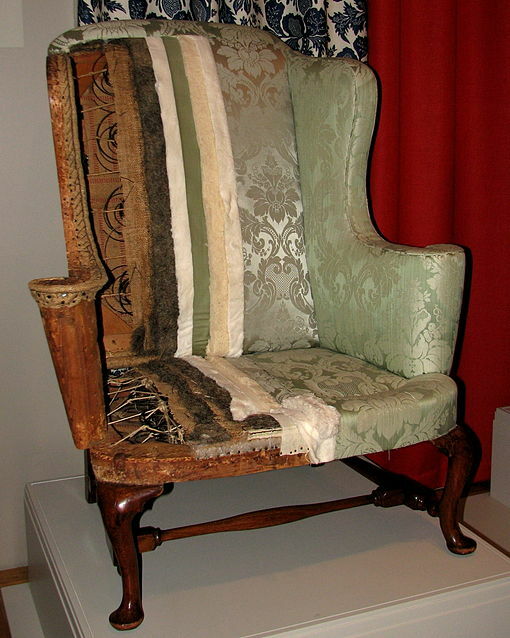 The job of an upholsterer has evolved too, in the 18th century they were used as interior designers, responsible for all a room’s decoration and furnishing, whereas now they are trained specifically in upholstery techniques. Upholsterers today could be working using age-old techniques on mass-made or bespoke pieces including chairs, stools, headboards, and sometimes even beds. In workshops or factories employees could be working on new pieces or offering their knowledge of classic design and upholstery to individuals or companies looking for repairs on antique furniture. Upholstery techniques are also employed in the motor industry, where staff are known as trimmers, coach trimmers, or motor trimmers who work on soft tops, carpets, roof linings and seats either during the production process, or direct with customers seeking repairs and restoration. Many upholsterers also gain contracts in the commercial sector, working on a wide variety of tasks for different businesses. Prime examples would be booth chairs, dining table chairs, stools for restaurants, lounge seating for hotels, prayer stools for churches, even dental chairs and bespoke wall decorations have been crafted by an upholsterer. Marine industries are also included in the mix and have their own set of considerations, with dampness, sunlight, and hard usage effecting how things are made and the materials used. If interior design and furniture restoration is a personal interest, then there are lots of opportunities to get involved and learn more about the craft, be it from short courses in craft shops, to longer college courses or workshops. Some may deal with general upholstery techniques, others may invite you to bring in a project to restore or maintain, or you could learn to make a brand new item such as a traditional footstool. Gaining knowledge from the experts and applying it at home can be a great way to learn, and when you couple upholstery techniques with care information, your antiques and upholstered furniture will last for years to come. Upholstery as a job involves design, colour and textiles such as leather, suede or cotton. Its hands on work needs an eye for detail and an interest in furniture design. Trainees learn about accurately measuring and cutting materials, finishing and trims and all the processes to get to the finished product. This may involve templates, covering frames with padding, making cushions and repairing frames to recover old furniture. As there is no fixed entry route into this sector, you can gain a trainee or apprenticeship position without any prior experience, although previous workshops will give you a good grounding into what the work will involve. You could take a qualification before looking for work, such as a diploma in upholstery focussing on traditional or modern techniques and there’s also courses available from The Association Of Master Upholsterers which follow on from each other, so a great way to advance your knowledge and techniques. The association also offers support and benefits if you decide to go self-employed, while newly employed upholsterers can expect on the job training. The history of upholstery is one that has evolved and developed along with furniture design, machinery, and new techniques and materials. Many of the traditional roots and techniques still remain, and there are plenty of opportunities to see and explore the classical and modern applications of this varied trade. Graham Doyle is the director of Pilgrim Payne & Co, who have developed an excellent reputation as specialist cleaners of soft furnishings. Pilgrim Payne & Co are officially recognised as a supplier to the HM The Queen and HRH The Prince of Wales.